Record drawing of a patera showing a face in high relief with blind eyes and collar, within an oval frame of radiating acanthus leaves with a leaf border. Adjacent are details of part of a whip, and part-profile of the plate. 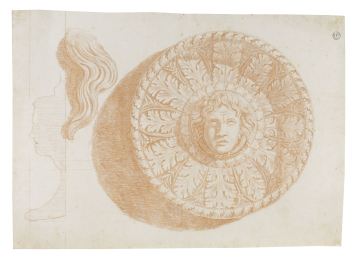 You are here: CollectionsOnline / Record drawing of a patera showing a face in high relief with blind eyes and collar, within an oval frame of radiating acanthus leaves with a leaf border. Adjacent are details of part of a whip, and part-profile of the plate. The plate and whip are sacrifical details from a temple relief, possibly taken from a patera in the frieze of the remains of the Temple of Jupiter Tonans (Vespasian) in the Roman Forum, which shows both (see G.L. Taylor & E. Cresy, The Architectural Antiquities of Rome, 2 vols., London, 1821, vol.II, p.18). Adam vol.26/85 shows a similar sacrificial relief including both whip and decorated circular plate. There are additional frieze reliefs of such subjects in the Palazzo dei Conservatori, Rome (see P. Bober and R. Rubinstein, Renaissance Artists and Antique Sculpture, Oxford, 1986, p.226).